Preliminary results from an ongoing study by IITA in Tanzania have shown an increase of nearly 60% in cassava yield which translates to a 30% increase in income for farmers. 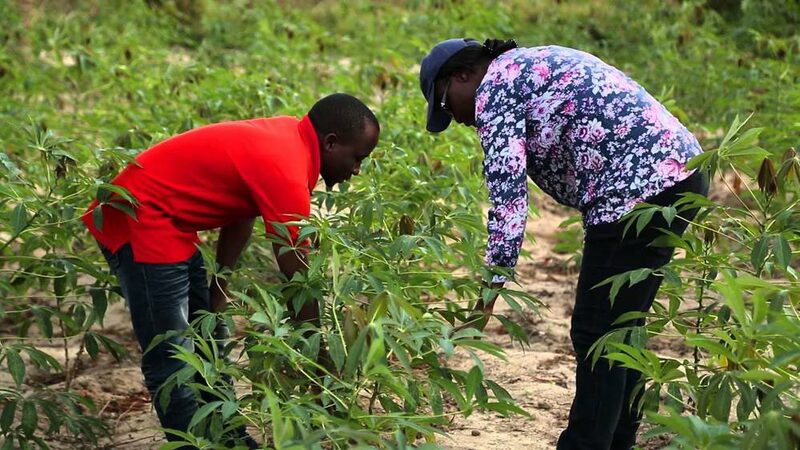 Veronica (right) assessing cassava in the field of one of the farmers involved in the study. 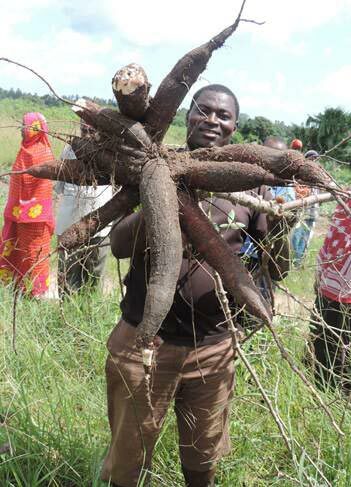 The study “Integrated soil fertility management (ISFM) for productive and sustainable cassava production systems in Tanzania” is being conducted in the major cassava-growing areas of Tanzania – Coast, Eastern and Western region. It is a part of the ‘Support to Agricultural Research for Development of Strategic Crops in Africa (SARD-SC)” project funded by the African Development Bank (AfDB). Cassava is an important staple in Tanzania and source of income to a most farmers in the cassava growing regions. The crop tolerates drought well earning the nickname “Rambo Crop” in the face of climate change and uncertain weather conditions. obtained after applying ISFM practices. However, its yield is low due to factors such as poor soil fertility, untimely planting, use of disease-prone planting materials, poor site selection, local and poor farming practices, and poor soil fertility management. The project has introduced ISFM which is a set of practices geared towards increasing productivity, sustainability and generating income for smallholders and the country as a whole. It includes the use of the appropriate varieties, efficient use of both organic and inorganic soil nutrients and good agronomic practices. “ISFM plays a critical role in maintaining both short and long-term availability of soil organic matter and nutrients which are key for productivity. It optimizes nutrient use efficiency in cassava production systems for maximum gains,” said Veronica Uzokwe, an agronomist at IITA-Tanzania and the project’s coordinator as she presented the findings at a seminar at IITA-Tanzania. In Tanzania farmers do not apply any fertilizers to their cassava. The study therefore looked at the response of cassava to increasing rates of N (nitrogen), P (potassium) and K (calcium) in the soils through application of NPK fertilizers. The preliminary results show a significant increase of cassava yields when farmer applied good agronomy practices and ISFM. 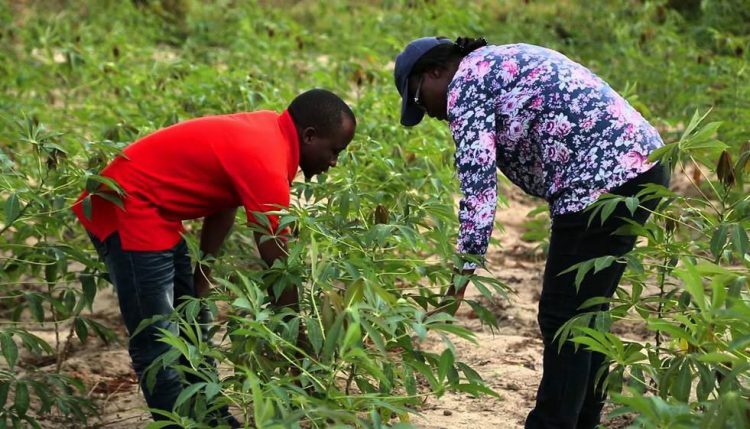 The study was initially conducted in the cassava growing areas in Zanzibar; Kigoma, Western Tanzania; and Mkuranga, Coastal Tanzania and has now extended to the Lake zone and Southern zone. “The study shows the great untapped potential to increase cassava through use of good varieties, applying agronomic practices, and soil fertility management such as use of organic and inorganic fertilizers. However, though ISFM has shown its potential to replenishing nutrients to depleted soils and maintaining soil fertility and enhancing productivity, it is not yet widely taken up by farmers. Farmers need more knowledge to use the technologies,” said Veronica. Study results have led to a spin-off project, the Africa Cassava Agronomy Initiatives (ACAI) funded by the Bill & Melinda Gates Foundation to continue investigating these technologies further. Other partners have come in to help in scaling out these technologies to more farmers. They include Cassava Adding Value for Africa (CAVA) project, MIJINGU fertilizer – a private company, Menonite Economic Development Associates, Farm Concerns International, and Agriculture Research Institutes and government agencies in Tanzania.